The International Baccalaureate® is a non-profit educational foundation, motivated by its mission, and focused on the student. Founded in 1968, the IB currently works with 3,845 schools in 148 countries to develop and offer four challenging programmes to over 1,206,000 students aged 3 to 19 years. To this end the IB works with schools, governments and international organisations to develop challenging programmes of international education and rigorous assessment. The International Baccalaureate (IB) is comprised of three academic programmes; the Primary Years Programme (for students aged 3 – 11), the Middle Years Programme (for students aged 11 – 16) and the Diploma Programme (for students ages 16 -18). The IB is an inquiry based programme that encourages students to think critically and be the masters of their own learning. In an ever-changing world, where fact and fiction can be manipulated with ease, the IB prepares its students to ask the questions that matter, ‘how do I know that?’, ‘why do I think that?’ ‘where do I fit in to that?’ At each stage of a student’s learning journey, the IB equips them to develop not only their academic capabilities, but also their capacity to positively influence the world around them through being reflective, open-minded, and truly global individuals. What makes the IB unique? The IB offers a continuum of education, consisting of four programmes for students aged 3 to 19. The IB enjoys a reputation for high-quality education sustained for over 35 years. The IB encourages international-mindedness in IB students. To do this, students must first develop an understanding of their own cultural and national identity. The IB encourages a positive attitude to learning by inspiring students to ask challenging questions, to critically reflect, to develop research skills, to learn how to learn and to participate in community service. The IB ensures that its programmes are accessible to students in a wide variety of schools – national, international, public and private – through its unique relationship with IB World Schools worldwide. How is the IB different to other curriculums? Unlike many other curriculums that operate under a standardised textbook heavy system, the IB, as an inquiry-based programme, encourages students to learn independently, to be innovative and creative, and to think critically at all times. These skills can be neglected in other curriculums that focus entirely on the passing of standardised exams, often at the expense of those all-important life skills needed for students to succeed in the real world of life and work. The IB fosters these skills from a young age and equips its students with the knowledge and know-how that they need for more than simply passing exams. Furthermore, as it’s a requirement of the IB Diploma Programme specifically that students take 6 courses, unlike for example the A-Levels 3, IB students will tend to be more well rounded upon graduating. This is because the IB will have necessitated them to study and engage with more disciplines, and for a longer time frame, than A-Level students will have had the opportunity to do. This also allows students more time in their academic journey to figure out what it is they are passionate about, before moving on to University to study a more specific field. There are a number of extra components that are central to the IB curriculum. 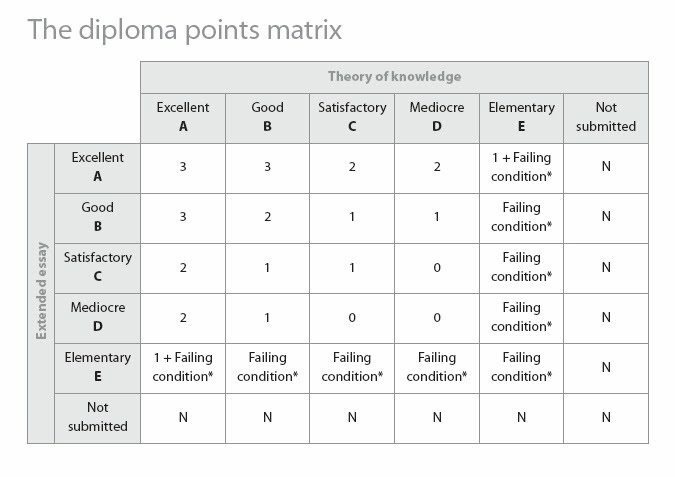 These are required for students to be awarded their Diploma: (‘Theory of Knowledge’ (ToK), ‘Creativity, Action, Service’ (CAS) and the ‘Extended Essay’ are further evidence of the IB being being a more well-rounded curriculum than many others. Students are required to question and understand how knowledge is arrived at in different disciplines within ToK. They are encouraged to develop their understanding of their role in life in relation to others with varying experiences of life in their CAS, and can hone skills relating to intense, high-level research and writing skills, while simultaneously being creative in their Extended Essay. Students who study the IB have the potential to be more able than students who have been immersed in other curriculums, to be reflective, internationally minded, well-rounded and at ease with critical thinking. These skills and personality traits are massively encouraged in most top universities around the world, as well as in the majority of fields within the world of work. The IB is a curriculum for those who want to give their children the best possible start in life, both academically and personally. It is a curriculum that encourages its students to do more than blindly accept what is put in front of them. It is a curriculum that nurtures within its students their natural capacity to question, to inquire, to be inquisitive and to think independently, critically and creatively. It is a curriculum that at its heart teaches children more than how to simply pass an exam. The IB is a curriculum that gives students the skills to answer life’s questions, not just those written on an examination paper for them to forget about upon leaving the examination hall. It is focused on high academic attainment while also having a truly holistic approach to learning. The IB is also the perfect solution to many difficulties faced by international families. Having been originally established as a direct response to what is often a severe lack of flexibility in varying school systems around the world, the IB is now recognised in more than 100 countries around the world. As international families are often moving to various different countries due to work relocations, it is essential that the educational systems their children are in are recognised by, and if possible, in line with each other. This is especially important when it comes to moving on to university. As a more specific example, unlike a lot of UK based systems, the IB does not focus on one single world view or history within its subjects, but is instead much more globally minded, thus creating more globally rounded and internationally minded students. How is the IB marked? Each of the six subjects studied in the Diploma Programme is marked out of 7 giving the student a maximum of 42 points. Candidates can earn up to 3 extra points for their Extended Essay and the Theory of Knowledge element of their studies. An IB diploma is awarded to students who score at least 24 points out of the total of 45 points available. Last July (2017) over 159,400 graduated with an IB diploma. Students received an average diploma score of 29.95 points, with 218 students achieving a perfect score. Since its foundation, the International Baccalaureate has challenged students to excel in their studies, encouraging both personal and academic achievement across the world. Southbank’s London based IB school is at the forefront of this. Founded in 1968, the International Baccalaureate (IB) Diploma Programme was established as a progressive non-profit educational foundation which aimed to instill children with the necessary skills to live, learn and work in a rapidly globalizing world. Influenced by the teachings of key educationalists John Dewey, A.S. Neill, Jean Piaget and Jerome Bruner the IB quickly grew to prominence throughout Europe, with the first official Diploma Programme exams taken by students in 1970. It’s legacy having spread to North America by 1975, the IB continued its rapid expansion, opening regional offices in Buenos Aires, London and Singapore shortly after in 1982. By 1994, the IB had expanded enough to introduce its Middle Years Programme for students between the ages of 11 and 16, adding the Primary Years Programme which hosts children from age 3 to 11 just three years later in 1997. In 2012 the Career-related Programme for students between the ages 16 to 19 was introduced. Today, the IB works with over 4000 schools in 148 countries to develop and offer four challenging programmes to well over a million students aged 3 to 19 years. With a hard-earned reputation for high standards of teaching, innovative leadership and student engagement, the IB plays a central role in the development of children around the world. Today, the IB represents far more than its educational programmes and certificates. With many IB World Schools across the globe and representatives in three Global Centre’s, the IB has gained renown for encouraging inquiring, knowledgeable and caring young people. The overall aim being to create a better and more peaceful world through intercultural understanding and respect. Take a look at our timeline that depicts the key events in the History of the International Baccalaureate. Our four programmes for students aged 3 to 19 help develop the intellectual, personal, emotional and social skills to live, learn and work in a rapidly globalizing world. Founded in 1968, we currently work with 3,681 schools in 146 countries to develop and offer four challenging programmes to over 1,138,000 students aged 3 to 19 years.